Weather and climate are similar but different. For the most part, they are very distinct phenomena. Below, we talk about the weather first, and then delve into the climate. We measure what’s going on in our atmosphere over a short period of time—usually in a particular place on a particular day—by assessing the weather. Could be cool, could be hot, could be dry or humid, might be cloudy or sunny, or somewhere in between. When we talk about “weather,” we’re discussing the changes we see and feel outside from day to day in terms of temperature, precipitation, humidity, wind, clouds, barometric pressure, and other factors. We have instruments to measure each of these elements, from the naked eye to the most sensitive barometers and satellites. Weather forecasts can cover today and/or tomorrow (chart #1), all week long or 10 days (the extended forecast, chart #2), or sometimes longer (chart #3), or even a whole year, like the Farmer’s Almanac predictions. Really bad weather is often time-limited by an event. The map at right shows total precipitation in central Europe from May 30 to June 3, 2013. During this time, the downpours seriously affected six nations. The major rivers Danube, Elbe, Saale, and others overwhelmed their flood defenses, causing billions of euros in damages. Another huge weather event last year was Super-Typhoon Haiyan (called “Yolanda” in the Philippines, where it struck hardest). Although the North Atlantic had its quietest hurricane season since 1994, Haiyan more than made up for it in the western North Pacific. Haiyan had the highest wind speed ever assigned to a tropical cyclone, and an unusually high storm surge. Said a recent weather and climate science publication: “Although Haiyan’s meteorological life cycle is measured in weeks, its impact on humanity within and beyond the region will be measured in generations.” The photos below are infrared (left) and visible images (right) of this monster storm. Solar energy primarily defines Earth’s weather and climate. The two main elements are temperature and precipitation. 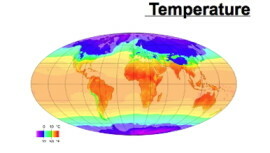 Temperature — Temperature is a measure of the warmth or coldness of an object or substance with reference to some standard value (Celsius or centigrade, Fahrenheit, or Kelvin). Precipitation — Precipitation is the amount of water in the form of rain, snow, sleet, etc. that falls from the sky. Climates vary not only in temperature but also in how much precipitation the place receives and how dry or humid it is. An area with little precipitation has a dry or arid climate. Latitude — Solar energy falls differently on at different latitudes. The nearer a location is to the equator (low latitudes), the hotter it will tend to be; the farther away (higher latitudes), the cooler. Roughly, the earth divides into three general climate zones (tropical, temperate, and polar), as in the graphic. In the tropical (equatorial) zone, it’s always warm enough to swim outside. By contrast, the poles are usually freezing, and often below. Wind and ocean currents — Hot air and water both rise. Cold air and water both sink. The way water and air currents interact with the world’s landmasses helps determine climate. Here’s a close look at the currents and the winds. Altitude — Elevation makes a huge difference to regional climate. Within a given latitude, places high above sea level (mountains) are cooler than those near sea level (coastal plains). 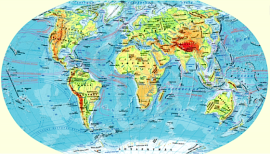 Different plants and animals have adapted to each of the world’s climate zones. One of the smallest and most climate-diverse regions on Earth is the Big Island of Hawai’i (see photo, right). There’s also a planetary climate. Earth’s climate is what you get when you combine all the climates around the world. For example, the climate of Mercury is always relatively hot. Life on Earth has been shaped by climate throughout the ages. Life as we know it on Earth depends on consistently habitable climate for each species. I hope that clears up any confusion you might have had regarding weather and climate, or simply provides a good summary of weather and climate if that’s what you were looking for.